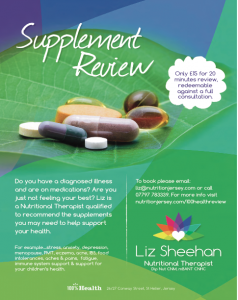 Liz Sheehan – Do you know your vitamin B’s from your coenzyme Q10? 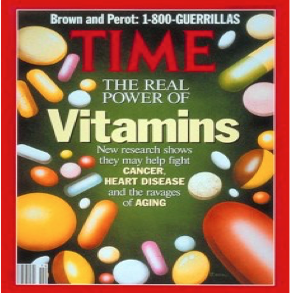 Liz Sheehan / Liz's Blog / Do you know your vitamin B’s from your coenzyme Q10? I’m sure that you have read about supplements or heard from a friend about what they are taking. I bet you have a cupboard at home full of them but do you remember what they are all for? Have you even opened the packets? Have you taken them and not noticed a benefit? Are you taking 20 different things each day? Do you feel like you need something but not sure what? I’m offering this supplement review to help you understand your individual needs. They are simply a Supplement to your diet. Diet and lifestyle have a massive impact on your nutritional status. If you are missing a certain food group such as fish, then it’s probable that you will need an omega 3 essential fatty acid supplement to make up for the fact that this nutrients is only available from food. Your body can’t make it’s own. Or if you are under a lot of stress nutrients are used up more quickly, or if you are on medications there are some nutrients that will need to be replaced from the “drug mugging” effect. Omega 3’s are essential for every cell of your body, for brain function, skin health and reducing inflammation and pain. Probiotics – repopulate your gut with the “good” beneficial bacteria. B vitamins – support energy function, are water-soluble and are used up very quickly when you are under stress. B12 and folate can easily be tested. Folate is especially important when trying for a baby and through pregnancy. Vitamin D – known as an essential vitamin, but it acts more like a hormone in your body. Our bodies make it under the skin from the sun and stored in your liver. This time of year (February) it’s possible that your supplies have somewhat been used up. I like to test to see just where your levels are at to know how to dose therapeutically. Needs to be taken with food as it’s fat-soluble. Iron – lots of you ladies may suffer with anemia especially if you have heavy menstrual cycles. This is a nutrient that needs to be tested for before supplementing. Too much iron is inflammatory and may cause unwanted/unnecessary side effects. Vitamin C – is often taken to boost your immune system. Did you know it can also nourish your adrenal glands?! Turmeric – a powerful antioxidant – it needs to be taken with food as it’s fat-soluble and black pepper increases it’s absorption. Coenzyme Q10 – this one needs to be taken if you are on statin medications. Statins are used for lowering cholesterol but they block this essential nutrient and can cause other heart problems long term. I believe that there isn’t a pill or potion that will fix a poor diet. But if you are really struggling with fatigue and that’s making it harder for you to make dietary changes then there is a place for them. If you are on medications then there may be nutrients that are being depleted by them, or nutrients that may interact with them. This is not necessarily something that you’ve been told by your GP. I’m able to bridge that gap between allopathic medicine and natural health care. I believe they work hand in hand. Integrative medicine. Many are of a low dose, cheap quality or have horrible fillers and binders in. You get what you pay for so go to a health food store that specializes in nutritional supplements rather than a high street store. Powders – easy to digest, and easy to adjust the dose. Tablet – not so easy to digest as the ingredients are packed so tightly together. 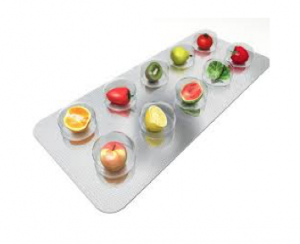 Capsule – easier to digest as the ingredients are not so tightly packed. Sublingual – very easy to absorb, bypass the digestive system straight into the blood. Liquid – easy to absorb but be aware of Sodium Benzoate a potential carcinogen that’s used to keep the flavour from spoiling. Some are better taken with food – iron. Some away from food – amino acids. Some are better taken in the morning – B vitamins. Some in the evening – those that aid relaxation. Some like calcium need to be taken 2 hours away from Thyroid medications to make sure the medication works properly. Anybody who is taking a medication/s (OCP, HRT, Statins, Aspirin, PPI’s, antibiotics, pain killers, thyroid medication, diabetic medication etc). Anyone doing a lot of exercise. 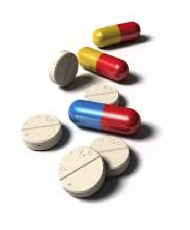 You ought to be supplementing to minimize/prevent side effects from the drugs or lifestyle factors. If you are on medications then you need to make sure you are not taking supplements that will interfere with the way you medication is meant to work. Consult a registered nutritional therapist before taking any supplements. If you don’t eat fish or you are vegetarian or vegan there may be nutrients that you are missing out on. For optimal health you may need to supplement these. Consult a registered nutritional therapist to see what your requirements are. So as you can see there is a lot to learn about supplements. Book a session with me to find out what you may need right now to support your health. The cost of your session is redeemable from a full consultation with me. In a full consultation we will talk about helping your body to heal through food so you no longer need the supplements, and talk about your long term preventative health because like they say “prevention is better that cure”.